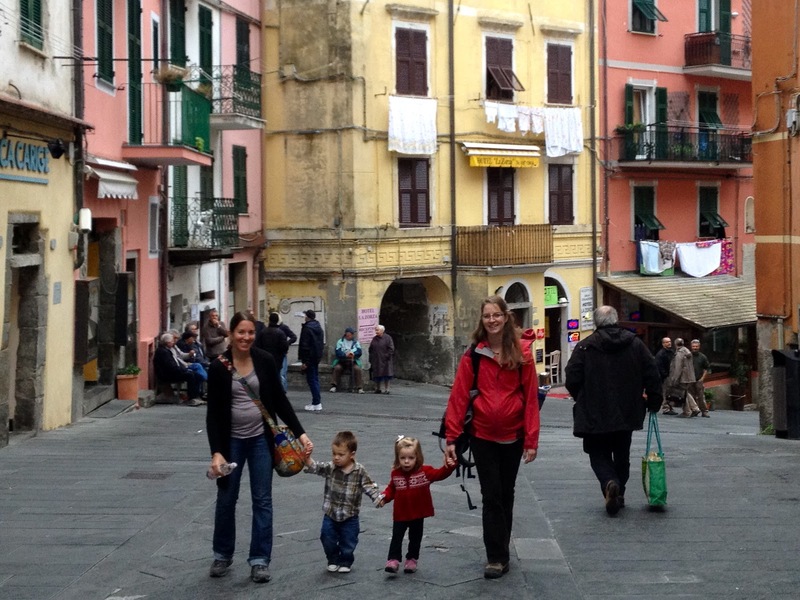 Making Room: Our Life in Sicily: back from Cinque Terre! There was a bit of radio silence here over the long weekend while our little family and our dear friends the Arthurs journeyed to Cinque Terre. (Remember them from this post?) We've done shorter trips with the Arthurs before but this was our first big one to a far-off locale. I have to say that I'm a fan of traveling with another family. It meant fun conversations for the adults, more help in the kitchen, lots of playmates for the kids, and Settlers of Catan games after all the little ones are in bed. Can you beat that?! In addition, we were visiting one of the prettiest places in Italy, a spot that has been on both of our bucket lists since we moved here. I have so many beautiful pictures to share with you soon! Sadly, over the weekend we received some terrible news that my beloved Aunt Holly (my mom's middle sister) had suffered from a brain aneurism. When my dad called me the picture was bleak, and by Sunday morning East Coast time Aunt Holly had died. She is wife to Uncle Will and mother of three incredible children, all of whom are dear friends as well as relatives of mine. I wept in our little apartment, staggered by yet another loss for our extended family after my sister's death this summer. Please keep the Rhodes family as well as my extended Palmer family in your thoughts and prayers. Oh Becca, I am sad to hear of another loss in your family. I just wanted to congratulate you on your birthday dear! May the Lord bless you and keep you always! Oh, so you really are pregnant...glad to know since you NEVER send me pictures. What gorgeous photos! I stayed in Portovenere for a month, a little south of Cinque Terre and it was one of the best experiences I've ever had. :) I cannot wait for the rest of your photos. So sorry for the loss of your aunt, praying for your family. Oh the Cinque Terre is one of my most absolute favorite places on earth! So amazing. It loks like you had a great time! Didn't mean that to sound insensitive - I'm very sorry for your loss as well. It's so hard being far away when sad things happen at home. Praying that you find comfort in the Lord while being apart from your extended family. I'm so sorry for your family's loss, Becca.